The View from Aristeia: C++11 Training Materials Updated--Now With C++14 Info! C++11 Training Materials Updated--Now With C++14 Info! For the seventh time since originally releasing them over three years ago, I've updated my annotated training materials for "The New C++". 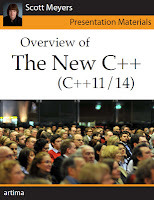 Until this update, "the new C++" referred to C++11, but with this revision, I'm including treatment of several features from draft C++14 that I believe will make it into the new new standard. As far as I know, this makes my training materials the first "book-like" publication that covers features in C++14. In accord with my "free updates for life" policy, people who've purchased these materials are entitled to (and should recently have received notification about) the updated version. Polymorphic lambdas (i.e., auto parameters). Generalized lambda captures (makes "move capture" possible). Generalized function return type deduction (i.e., auto return types). Reader/writer locks (i.e., std::shared_mutex and std::shared_lock). There's also a page summarizing other C++14 features, along with a slew of references for people who want to read more about the new goodies in C++14. If you haven't done so already, I hope you'll consider purchasing a copy of these materials. As always, a free sample PDF of the first ~40 pages is available here. Don't expect too much C++14 information in that sample, because the first serious treatment of C++14 features begins on slide 90. That's not me being coy. It's just how things worked out, given the flow of topics in the course. I just downloaded my upgrade. Everything seems fine. Thank you. @Anonymous: Here's the word from Artima (the publisher): "Anonymous will need to create an Artima account to get the eBook. It's quick and easy. They don't need to create a username, just give an email address and password. The email address is used to send them a receipt. The password allows them to log in later and get the free updates." That's cool. Thanks for the reply. With C++14 coming into sight and announced C++ release schedule the lifetime update does sound good. 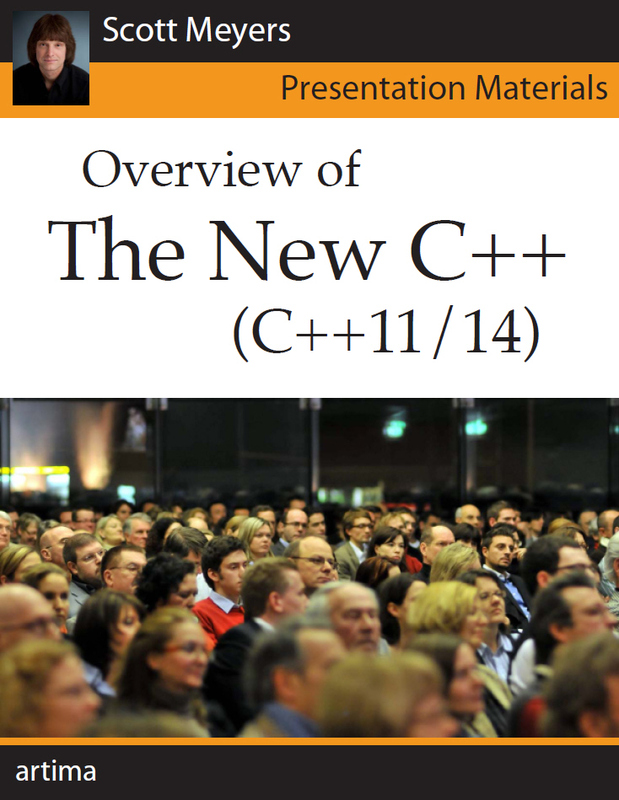 will there be a print version of this c++11 pdf material ? @Anonymous: I don't plan for there to be a print version of the materials. If you want it in print form, I suggest printing it yourself and putting it in a binder.